Story originally posted at 12:40 a.m. Updates will continue throughout the day. In a pre-election article focusing on the possible (and now real) outcome of the national Congressional races, Dave Kopel, research director at the Independence Institute, said this: "Things look a lot better for the Second Amendment than they do for the Republican party." That statement is equally true of the Election Day outcome in Ohio, where several pro-gun Democrats were chosen instead of or to replace anti-gun Republicans. Ohio gun owners will have a pro-gun governor for the first time in 16 years. Democrat Ted Strickland easily defeated Republican Ken Blackwell, who was also a pro-gun candidate. Betty Montgomery opposed legislation which became Ohio's concealed carry law in 2004, and told Buckeye Firearms Association Chairman Jim Irvine that she would never be the candidate of the NRA. She has been defeated by Buckeye Firearms Association endorsee and Democrat Marc Dann. 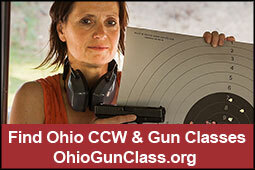 Buckeye Firearms Association endorsee Mary Taylor was able to overcome a serious trend against Republicans in Ohio. Gun owners are fortunate that in Taylor they have another statewide office-holder who strongly supports their gun rights. Buckeye Firearms Association endorsee Sandra O'Brien was unable to overcome the move for change in Ohio. Gun owners are fortunate that in Richard Cordray they have another statewide office-holder who supports their gun rights. Although the Republican majority has been reduced significantly, the pro-gun majority is firmly in place. A massive majority of Buckeye Firearms Association endorsees will again represent Ohio gun owners in the State House under the leadership of Speaker Jon Husted. A large majority of Buckeye Firearms Association endorsees will join a body that has, in recent years, been all too willing to do Bob Taft's bidding on gun bills. Ohio voters are sending a large majority of Buckeye Firearms Association endorsees to Washington D.C. Even where endorsee Joy Padgett was unable to overcome displeasure with scandal-ridden Bob Ney, whom she sought to replace, gun owners are fortunate that in Zack Space they can still expect to receive solid votes on behalf of their gun rights. Last week we presented the question on who offers more votes - the NRA or editorial boards? Brady Campaign-endorsed, anti-gun Republican Mike DeWine chose to pursue votes via the editorial boards, and while consistently snubbing Ohio gun owners. He lost. Question answered. Unfortunately in this contest, there is no silver lining. Senator-elect Sherrod Brown is as equally opposed to our Constitutional rights as was DeWine.